Summer time calls for all things mango, so why not your drinks too? 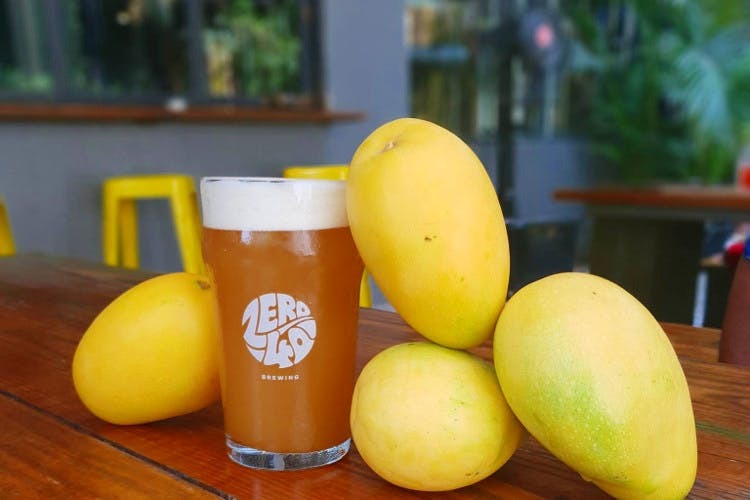 At Zero40 Brewing, get yourself a glass of mango ale and unwind in fashion. This brewing company is known to make fresh brews based on the season and the mood of their brew meister, and the mango ale is one of their summer specials launched in May. Made from Banganapalli mangoes, and containing 5 per cent alcohol, this drink retains the sweet mango flavour and yet it can give you a buzz. So, get to the bar at this four floor brewery and let the mango ale flow from taps into your glass or book a table and order in. It costs INR 325 for a pint and INR 895 for a 1,500 ml pitcher. You can also get their 1+1 offer on beer pitchers with the mango ale every Monday and enjoy this drink until the month end. So, hurry up and get here with bae or bff and make the two to mango as you taste that mangonificent ale today!